When Holly Hobbie was a young girl, her family lived in a city neighborhood packed with children, pets, and grown-ups. The houses were close together. Holly Hobbie’s family lived on the third floor of one of the buildings. She loved living there. Then one day, her parents bought an old farm out in the country. It was a little run-down, but the family would fix it up. Holly Hobbie did not like it. In fact, she was frightened by many things there, like a fierce rooster, some cats who could not be petted, and a spooky outhouse. The family had a dog, some friendly cats, ducks, geese, chickens, a pig, and a cow. But, they didn’t have a horse. Several families nearby had horses, and would ride past Holly Hobbie’s family farm. Holly Hobbie visited the horses in their pastures and became friendly with them. She thought her family’s farm had everything needed for a horse – pasture, barn with stalls, hay, even bridles and harnesses. She thought about horses all of the time, scattered horse droppings in one of the stalls (so it would smell like a horse), and drew detailed pictures of horses. But, everyone in her family had reasons for not getting a horse. 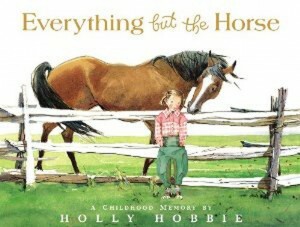 On her birthday, Holly Hobbie’s mother told her to go look in the barn for a special present. She ran out to the barn, hoping to see a horse. Instead, she found a brand new, red, two-wheeler bike with a leather seat, and Columbia written on the crossbar. She took her new bike out for a ride. “And I flew down Middlebury Road, pumping with all my might. I flew! This is a sweet story of childhood, with beautiful illustrations. Somehow, the reader is not upset that Holly Hobbie is given a bike rather than a horse – and it seems that the author was happy with the bike, as well. Holly Hobbie has worked as an artist for more than thirty years (remember the Holly Hobbie greeting cards and dolls in the late 1960s and 1970s?) and is the author of the Toot & Puddle picture books, and the Fanny & Annabelle books. Stopping by from the Kid Lit Blog Hop. Thank you for sharing this wonderful book. I loved Holly Hobbie when I was little and had almost forgotten about her. I even had Holly Hobbie bed sheets. Your post conjured up fond childhood memories and I plan to share this book with my daughter. Thanks for stopping by! I had a Holly Hobbie pillow, and saved several greeting cards because I liked the pictures. I hope you and your daughter enjoy the book. Thanks so much for hosting the Kid Lit Blog Hop, and for stopping by! Holly Hobbie was part of my childhood, too. A very endearing story 🙂 thank you! Thanks for highlighting this book! My daughter loves horses and I’m sure this book would thrill her! I’m hopping by via the Kid Lit Hop! Thanks for stopping by from the Kid Lit Blog Hop! I hope your daughter likes the book! This looks lovely. My daughter has become horse mad but I’m planning to buy her a bike too! Found you on the Kid Lit Blog Hop. This looks great! I love Holly Hobbie.